This session promises to take a look into how to include conversion optimization into every step of your marketing strategies online. Solo presenter Mikel Chertudi of Adobe starts off with telling us that he has about 500 people in the marketing department there. He brings this up because he feels larger organizations have the challenge of putting together proactive processes that work across departments. This is going to be part of the conversation today. First, continual iteration and optimization leads to success. Expert organizations in the field of optimization typically have a person or a team dedicated to testing. You are targeting and segmenting behaviorally; you see marketing ROI and sales increase 50+ percent. There are beginner and intermediate organizations as well. 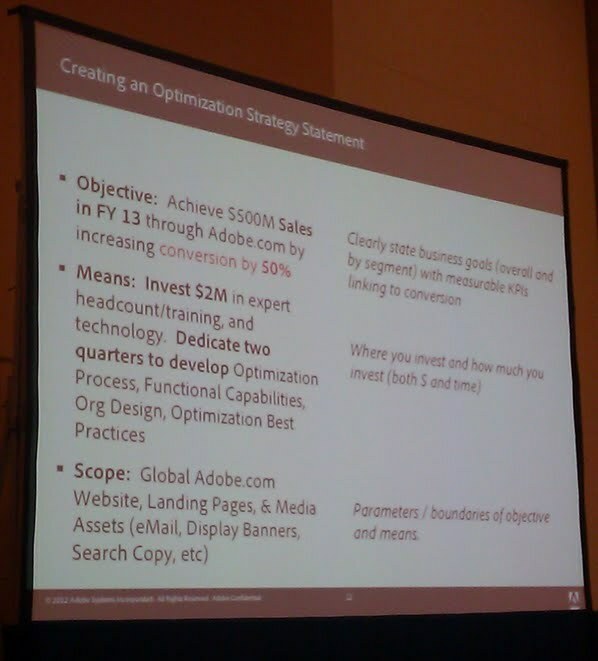 Alignment and strategy: Link your conversion optimization to company’s business strategy. Process and organization: Understand the processes for creating a culture of optimization. Tactical execution: Which tests have the greatest impact on increasing conversion. You have to translate conversion to marketing budget. For example: If we increase conversion by 50 percent, we will increase ecommerce sales by $25M this year, and lead to an ROI efficiency of 56 percent. This is the language of the CEO and the executive team. Learn to start speaking this way for buy-in. Back in the earlier days of Web marketing, there wasn’t much process because the Internet was new. The past 15 years has evolved to give us good standards of how we organize ourselves. Operating model alignment: What is the goal or goals? Process design: All the people conversion optimization is going to touch. Change impact and readiness: What does the road map look like so we know we are ready to invest and be successful in conversion optimization? Organizational design: Hire the right people and move them around as needed to get it done. End user training: Make sure everyone involved has the tools necessary to be successful. When you’re looking to implement, identify the “daisy chain”: Drivers, approvers, contributors. You’ll need exec support, investment in tech, investment in training, dedicated IT resources, dedicated marketing optimizers, dedicated Web analysts, User experience alignment, content and creative production, brand alignment — all with a process to perpetuate the culture. On culture: In his organization, they have a blog that is dedicated to conversion optimization and a weekly update via email internally. They also have meetings every month that have grown in numbers to keep the company updated on how conversion is affecting ROI. They have free tools for people to test conversions — making it fun. The right design on your site and user experience. This includes things like layout and sizing of the content, and what types of content like integrating social elements and more. [Don’t assume integrating social is always a winning ideas; in Adobe tests, they found one of their pages where community content didn’t positively impact conversions]. Lead form and ecommerce process testing. This is” the checkout” or the lead captures. The right lead form can increase conversions up to 500 percent. Tool tip: Check out DemandBase. Headlines, bullets and body copy. He is talking about B2B nurture emails and gives these tips: personalize to contact, make it highly relevant to the audience, all-text emails, sent on behalf of sales, include links to landing pages with specific offers with high-value content (reports, etc. ), all priority responses go to sales and hopefully they call the people back in three minutes. They tested an element in an email, posing a question versus a statement in their emails; the statement won. They also tested bulleted copy versus a paragraph; the bulleted copy increased conversions by 31 percent. If it looks easier to read, people will want to read it. They tested one offer versus two offers; two offers won. They tested subject lines — offer name versus a relevant question; the offer name won the test. Imagery. This includes things like banner image testing. He is showing examples of some of the tests they’ve done, and he says don’t always jump to conclusions when it comes to imagery. Data-driven people are usually against the creatives in this area. But, you might be surprised what actually converts. They found a banner ad that was designed beautifully but was hard to read actually won over the more straightforward banner ad. The marquee area = money — this area is very good real estate; use it. Calls to action. Make sure people can see your CTA. This is things like links versus buttons for CTAs. He found in one of his tests, the buttons increased CTR by 44 percent, which translated to $195,000 in annual revenue. He also tested things like “download guide” versus “download white paper” — downloading a guide had more conversions because they believed that people felt it was less technical and easier to read. But don’t say “guide” if it truly is a white paper. Decide which type of content to create. He ends with KIS: Keep it Simple.